What happens when 3 geeky Computer Science PhDs (Igor, Matej and moi) want to motivate themselves to exercise more? JIM is born, the mobile and web application to bring fun and simplicity to strength training. There’s a ton of activity trackers and fitness applications out there. All following the same patterns of manually entering parameters. But, do you want to swipe and type on your phone while sweating in the gym? Neither do we. The solution is an application for fitness trainers as much as it is for trainees. A brutally simple, straightforward mobile application backed by a powerful web back-office. JIM allows trainers to onboard more trainees as it gives them a clear overview. And gives trainees a portable trainer to keep at all times in their pocket. I wore several hats. 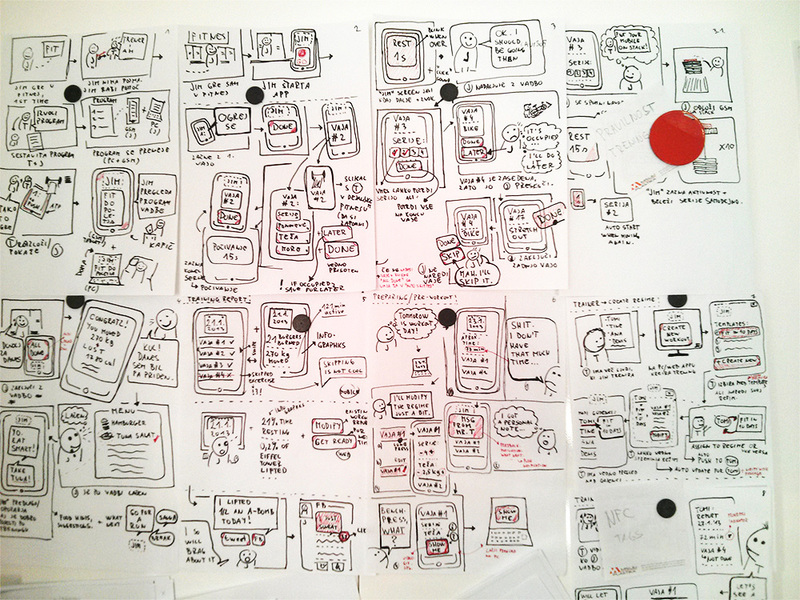 User research, product design as well as branding. None of us had the domain expertise, so we involved the fitness trainers. With the help of gamification and my EPUI methodology they became active co-designers. To motivate the trainers, I challenged them to a competition. If I do my rounds in the gym, they participate in the design process. The persona was called... JIM. And later came the brand. Together with the 2 dev friends we were outlining the scenarios we observed during research. My friends know that I'm a sucker for naming products. The same as with Edgar, we also hit the jackpot with the name with JIM. It's a great wordplay and together with Marusa, we designed a cool matching identity. We iterated super fast and cheap. Using post-it notes, and plain sheets of paper and a bunch of Skype/Hangout calls. 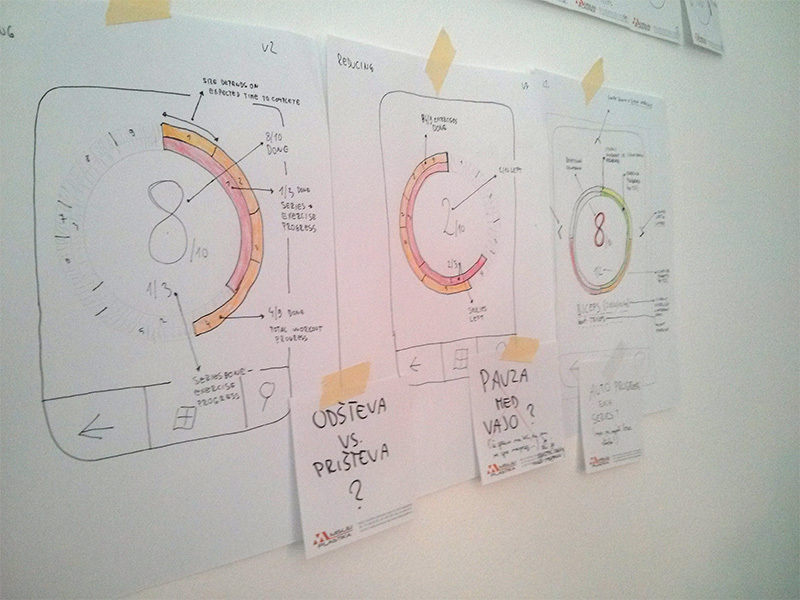 Every paper prototype was tested with the users as soon as possible. But firstly, we tested it as a "paper UI story" in the team. There is only 1 button that also serves as the main display for current activity. Users get their training regime by the trainer and all they do in the gym is follow the instructions. Machine occupied? Well, do it later. If needed, trainees can always see how they're doing and ask for expert advice/help. The request is sent to the trainers's dashboard. Information such as progress report is served to the user when needed. In a slick, visual way. Of course. The UI is straightforward to eliminate any unnecessary interruptions during training. If needed, one finger is enough to operate the app. We launched the Windows Phone version first - partly because we won the Imagine Cup Finals and wanted to build on that momentum. The interface is extremely clean and I used a strictly no-nonsense design. The one-button concept was a complete hit both with trainers and trainees. The web application is still a work in progress, but it is fully operational and the beta trials are running smoothly. The web application is used mainly by trainers as they prepare the training and monitor the activity of their trainees. With JIM, they are able to work with more trainees at a lower price point.